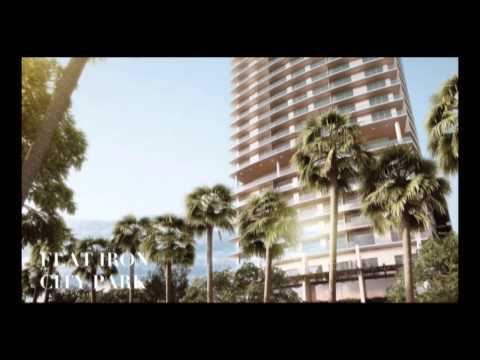 1100 Millecento Residences is one of Brickell’s most centrally located condominium development. Completed in 2015, 1100 Millecento includes 382 condo residences comprised of studios, one-bedroom, one-bedroom-plus-den, and two-bedroom floor plans ranging in size from 578 to 1,270 interior square feet plus balcony (see 1100 Millecento floor plans). 1100 Millecento was developed by Related Group and designed by Carlos Ott, an internationally-acclaimed architect who also designed Jade Beach and Jade Ocean in Sunny Isles Beach. The interiors and common area spaces at Millecento Brickell were designed by Pininfarina, the legendary designers behind the avant-garde designs of Ferrari, Peugeot, Maserati, and Alfa Romeo. Millecento Brickell rises 42 stories, offering beautiful views of the city. 1100 Millecento condominiums offers its residents an array of luxe amenities, including a rooftop pool and sundeck (located on the 42nd floor); state-of-the-art fitness center; club room with bar and lounge, billiards table, catering kitchen, and multimedia facilities; health spa with men’s and women’s steam room and sauna; theater with state-of-the-art audio/visual equipment; private cabanas; 24-hour concierge and security; and 24-hour valet parking. The condo residences at 1100 Millecento feature contemporary Italian cabinetry, stainless steel kitchen appliances, imported stone countertops, spacious soaking tubs and glass-enclosed showers, designer bathroom fixtures and accessories, in-unit washer/dryer, generously-sized balconies, and floor-to-ceiling glass windows. 1100 Millecento condos is centrally located in Brickell at 1100 S Miami Ave, Miami, FL 33131. Its location puts it steps from the upscale shops, restaurants, and entertainment at Brickell City Centre. Additionally, Millecento Brickell has a number of ground-floor retail spaces which accommodate a cigar and whiskey bar, taco restaurant, ice cream shop, and Japanese restaurant. By car, 1100 Millecento is 8 minutes from the American Airlines Arena, 15 minutes from Wynwood Miami, 17 minutes from South Beach, and 30 minutes from the Miami International Airport. Imported designer porcelain tile floors. What is the pet policy for owners and renters at 1100 Millecento? 1100 Millecento is a pet-friendly condo development for both owners and renters. The pet policy permits each residence to have no more than two (2) pets. There are no weight restrictions. Prior to move-in, tenants who are pet owners must pay a non-refundable pet fee of $300 to the condo association per pet. Which utilities are included in the 1100 Millecento condominium association dues? High-speed internet, water, sewer, and trash removal are included in the condominium association dues. What are the rental restrictions for 1100 Millecento condo? Owners may rent their units a maximum of three (3) time per year. No lease can be less than thirty (30) days.